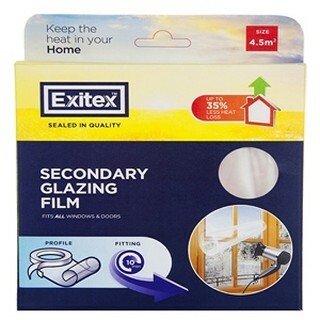 The window glazing film from Irish company Exitex is know as draught seal and is the most cost effective way to add secondary insulation to your windows and help lower your heating costs. 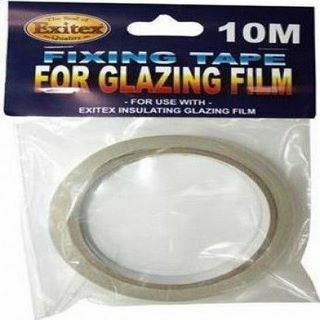 Available in three different sized packs 1.8 square meters (150cm x 125cm) , 4.5 square meters (3m x 1.5m) and 9 square meters (6m x 1.5m) each pack comes with double sized fixing tape to easy the installation process. Once installed on single glazed windows this product will provide heat retention in a room not far removed from that of a double glazed window but at a fraction of the costs. The film itself is made from a heat shrink type of plastic. During the installation a hair dryer is used to remove and creases and effectively means that the film will go virtually unnoticed when installed. The insulating glazing film can be installed on most window frames including aluminium frames, vinyl and wooden frames which are either varnished or painted and is suitable to fit on small and large windows as well as glass patio doors or conservatory doors. 1: Before installing film it is very important that hands are clean. It is also important to avoid touching the inner surface of the film or the exposed adhesive tape. 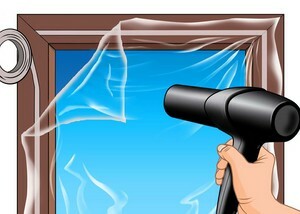 2: Wash window or door glass and dry thoroughly using a clean cloth. 3: Clean frame thoroughly ensuring to remove any dry or grease. 4: Measure window frame and cut strips of the adhesive tape to measure. Apply tape to the to the top, bottom and sides of frame. If the room is particularly cold on the day of insulation warm the window frame with a hairdyer before applying the tape. 5: Unfold and cut the film slightly larger than the taped area of the window (about 10mm ideally). Ensure that the inside fold of the film faces the window ready for application. Note: The film supplied is double folded when you open the packaging. 6: Remove backing paper from adhesive tape and press film firmly into place along the whole length of tape. Keep the film as smooth as possible to avoid wrinkles. 7: Allow 30 minutes for the tape adhesive to cure then holding a hairdryer a few inches away from the film apply heat starting from the top and working downwards. It is important to keep the hairdryer moving around all the time to avoid over shrinking the film. Continue this process until the film tightens and wrinkles smooth out. 8: Leave film for about 10 minutes then test it is installed correctly by flicking it lightly with your finger. If it makes a drum type noise then it is installed correctly. 9: Use a scissors to carefully trim film overlapping the adhesive around the frame of the window and your done. Can this film also be used to stop firepalce drafts? The film might be effective for stopping fireplace draughts but I would imagine it would be very difficult to install on a fireplace. I would strongly recommend you consider a chimney balloon though. Is the film easily removed? Is there any residue left behind? Im sure it will leave a little residue when you take it off like most adhesive materials but nothing that a little warm water won’t remove. The product is primarily aimed at single glaze windows but there is no reason to the best of our knowledge why it can’t also be installed on double glazed windows. It should make some insulation difference. 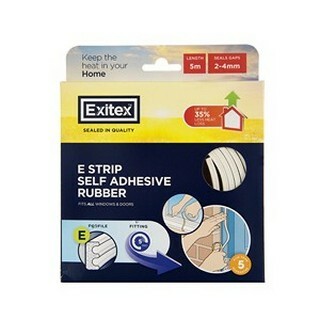 I am living in swords area, can you tell me where i can buy this product from. You can buy it directly from us and it will be delivered to your door tomorrow before 5pm. Order online or call us on 066 71 36 486 and we can take your order over the phone. We can’t offer any guarantees as every house as a different level of dampness or condensation but some customers have certainly claimed this film has worked for them in this regard.